Rammurti S. Mishra, M.D. (also known as Ramamurti S. Mishra and Shri Brahmananda Sarasvati) had an extensive background in Eastern and Western medicine. In 1955, after years of practicing and teaching medicine and surgery in his native India, he came to the West for further research and advanced medical studies. In the years that followed, he served as a resident physician at leading university hospitals in the United States and Canada. 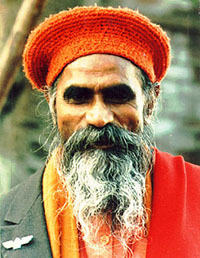 In 1958, he founded the Yoga Society of New York. Ananda Ashram, which he founded in1964 in Monroe, New York. His life was unique and brilliant, a life of great and tireless service and enormous accomplishment. He was a medical doctor, neurosurgeon, psychiatrist and professor of medicine. Shri Brahmananda was a gifted teacher and lecturer, a recognized authority on Yoga, Sanskrit and Vedanta. He is the author of "Fundamentals of Yoga", "The Textbook of Yoga Psychology" and "Self Analysis and Self-Knowledge", a translation and commentary on Shri Shankaracharya's Atma-Bodha. "Nobody is a fool and nobody is wise. It is the space which makes you foolish or wise. If you have space within your mind, then you become wise, and if you have no space in your mind, then you become 'otherwise'." Shri Brahmananda was a master of the Sanskrit Language. He used the power of Sanskrit to its fullest capacity by using Sanskrit chanting for psychosomatic healing and union with cosmic energy, or cosmic I Am. He taught thousands of hours of intense study of Sanskrit grammar, from the study of the Devanagari alphabet up to the advanced grammar of Panini's "Ashtadhyayi". Shri Brahmananda's life was dedicated to the integration of ancient & modern, Eastern and Western sciences, culture, and philosophy, with the intention to bring about the full realization of individual and universal peace, harmony and spiritual unity. His students at both Brahmananda and Ananda Ashrams continue on the same aims and spirit with which the ashrams was founded.